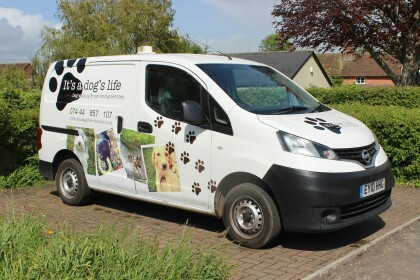 It is very important to me that dogs in my care feel as secure and happy as possible, I believe I have achieved this with my new van. The van I use is now fitted with four spacious and various size dog cages. Whilst some dogs are nervous about getting into the van initially, others now associate it with going out with their companions and will happily jump in. Under these circumstances no dog will share the same cage, each dog will have their own personal space. Rubber mats have also been fitted within each cage to insure your dog does not slide around whilst in transport. This ensures they may sit or lay comfortably. I have also fitted barriers so that the dogs cannot see each other but are aware of each other, this helps significantly with the more nervous or newer dogs who are reluctant to get in. If you see the van out and about be sure to give me a wave! It’s certainly not easy to miss!